The marshrutka phenomenon resounds with multiple synonyms throughout the world which witness its geographic width, and its relevance to future research: dolmuş, matatu, bush taxi, dollar van and their cognates daily serve millions of users; primarily but not exclusively in the developing world. funding for the once very extensive public transport systems withered. The deregulated legal environment lead to a surge of individually operated marshrutkas which came to serve the population’s mobility needs. The low market entry threshold lead to a quick spread of the marshrutka phenomenon throughout the former Soviet Union. Today, marshrutkas are being widely criticized, for being unsafe, uncomfortable or polluting. Yet still, they feature a series of very user-friendly interfaces, both for passengers and drivers, which make them popular for a broad scope of urban dwellers. For passengers, marshrutkas bring about small headways and – at least at peak times – the possibility of getting on and off on demand at almost any (convenient) place. These benefits are complemented by high speed (surely obtained via fearless and reckless driving). For the driver, the marshrutka implies a direct source of income, a leeway in personal and professional self-organization, and the liberty of not taking passengers enjoying trip fare privileges in municipal transportation. These features taken together create a unique style of passengering, characteristic for urban mobility of the last two decades in ex-USSR. The UITP classifies marshrutkas as one form of “informal transport”. This, we would argue, falls short of explaining the breadth and the importance of the phenomenon, particularly in the light of remarkable auto-regulation of the sector from below; the elaborate interplay between passengers and drivers; and the recently increased state regulation attempts of this transport sector – not only in the former Soviet Union, but on a global scale. We rather should look at the transformation of public transport systems as a part of societal transformation at-large. The rise of marshrutkas is an essential element of this process. Still, as an object of research, marshrutkas and their siblings around the world seem to present a remarkable gap. While urban public transport in general is already not at the top of scholarly attention, its marginal and changeable variations are even more in need of detailed analysis. Institutional change and privatisation management was one main focus of research mentioning “informal transport” solutions, such as in Southeast Asia (Roschlau 1989), and EU accession countries Poland (Pucher 1995), the Czech Republic (Pucher 1999) and Hungary (Hook 1999). For the former Soviet Union, studies exist, among others, on Uzbekistan (Akimov & Banister 2010, Gwilliam et al. 2000), Kazakhstan (Finn 2008, Gwilliam 2000, Gwilliam 2001) and Tbilisi (Finn 2008, Grdzelishvili & Sathre 2008). However, these works did not deal with social and cultural aspects of public transport in a transition period. The effects of public transport on space production also remain under scrutinised. The same goes for anthropologically grounded research of the role of public transport in identity formation and power relations. Going in that direction, the most extensive corpus of literature exists for the US-American jitney phenomenon of the early 20th century (Brownell 1972, Davis 1990, Schwantes 1985) which provide an insight into how shared taxis herald the onset of mass motorisation and accompany the decline of “traditional” public transport. As for research in contemporary “informal transport”, we should mention a detailed World Bank study on urban transport in Africa (Kumar & Barrett 2008), which highlights the crucial importance of this low-key transport solution for everyday mobility, and the large diversity of the phenomenon. 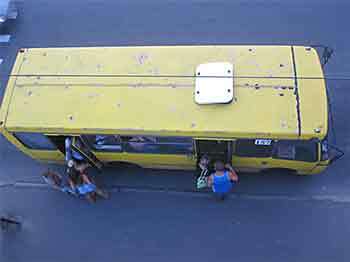 We should further acknowledge Müller-Schwarze’s (2009) anthropologically grounded research on Diablos Rojos – the painted buses in Panama and their significance for urban and national identity, and Suzukis (1985) in-depth study on semi-legal US-American ethnic public transport. -out the marshrutka network, many towns would be isolated from governance structures and may cease to function within the greater economy” (Wondra 2010: 9). Marshrutka research has furthermore its place among the politicized polemics on mobility strategies. In spite of marshrutkas’ being extensively criticized within a “Sustainable mobility” mainstream, they are at the same time applauded by proponents of demand-responsive transportation as “lessons to be learnt from less developed countries” (Silcock 1981, Enoch 2005: 68). A series of intriguing questions on the marshrutka phenomenon still need to be answered: How did they gain success in early post-socialist period? What are the interrelations between technological development of marshrutka vehicles and passenger practices? How did marshrutkas change cultures of waiting? What is the role of marshrutkas in producing post-Soviet urban space? We invite interested researchers to share their thoughts and ideas in this exciting field of non-mainstream urban transportation. Wladimir Sgibnev holds a MA in Comparative political science and Eastern European Studies from Sciences Po Paris (France) and a PhD degree in Central Asian studies from the Humboldt University in Berlin (Germany). His thesis addressed the production of social space in urban Tajikistan. He is currently a researcher at the Leibniz Institute for Regional Geography in Leipzig (Germany), working on urban mobilities in post-Soviet countries. Andrey Vozyanov holds a MA in Cultural Anthropology from the European University at St. Petersburg (Russia). His master’s thesis analysed passengering practices of urban older-than-60 population in post-Soviet Ukraine. He is applicant for a PhD degree and, currently, guest researcher at the Institute for Regional Geography in Leipzig (Germany) collaborating in research on urban mobilities.